Is… is that stagnant water??? GET IT AWAY BEFORE WE HYDROPLANE AND DIE!! On my way home from work on my bike, I got to experience the magic of the rain bringing out every wonderful smell imaginable in these California mountains. I could smell sage, rosemary, and things that I couldn’t put a name to. All the while I got this 70’s song stuck in my head which is great because I’m 20. I decided for dinner I’d cook something with whatever of these ingredients I could find. And lemons too. This was before I decided to be healthy and switch out the butter for a lemon. Use a lemon. Do not wash off the potato!! You will have soggy potatoes, and will be disappointed. As will I. Cut the potato into chunks, and throw them in a bowl. 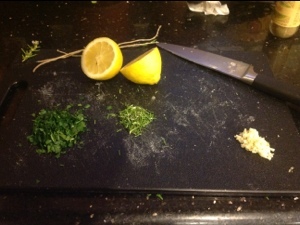 Next chop up the parsley, rosemary, sage (I used dried) and garlic. Cut the lemon in half. 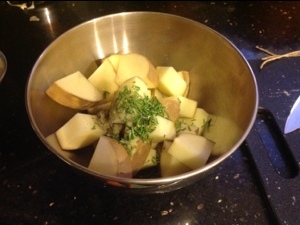 Add the sage, salt, pepper and 1 tbs of rosemary to the potatoes, with the olive oil. Mix with your hands until the potatoes are well coated. Set aside. Wash off the chicken, and pat it dry with a paper towel. Put it on a plate and squeeze the whole lemon on the chicken, rubbing the juice into the skin and on all sides. Sprinkle on the rosemary, parsley, and garlic. 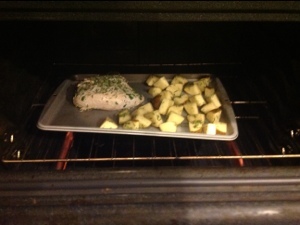 Place both the chicken and potatoes on a baking sheet. Try to be sure that the potatoes are put on the sheet skin down, which will keep them from sticking so easily. If you’re afraid of sticking, you can wipe the sheet with an olive-oiled paper towel. Bake 40-45 mins until the chicken juices run clear. 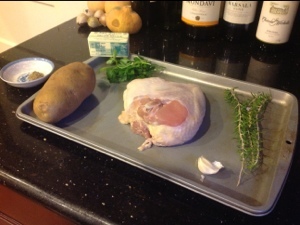 Take everything out of the oven, and remove the chicken onto a plate, covering it with foil and allowing it time to rest. Meanwhile, increase the oven temperature to 400. Once pre heated, put the tray of potatoes back in the oven for an additional 5 minutes, or until they are golden and crispy.